I was bouncing – yes, literally, physically bouncing – in my seat as our big green Hobbiton bus pulled up to the entrance to the former movie set. Elliot found my enthusiasm amusing; after all, this wasn't my first visit to the Shire. In fact, it wasn't even my second! This would mark my third trip to Hobbiton (second since it was rebuilt to be permanent). But this would be my first time joining the site's Evening Banquet Tour. 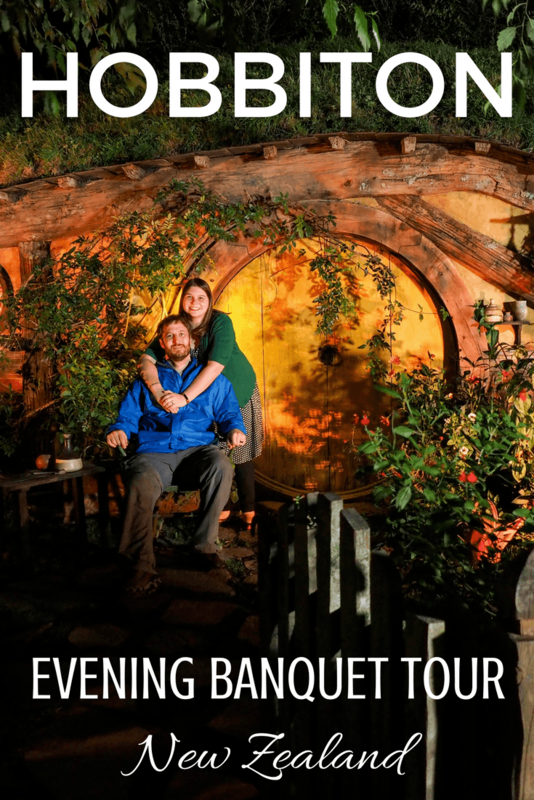 The Evening Banquet Tour at Hobbiton is essentially a fantasy-lover's ultimate date night. It starts off with a tour around the Hobbiton movie set, proceeds into the Green Dragon pub for drinks, moves on to a hobbit-inspired two-course feast, and concludes with a nighttime walk back through the set by lantern light. To say that I was excited to try this new-ish offering would be an understatement. Tickets for this experience were literally the first thing I booked for this trip to New Zealand. So what is the Evening Banquet Tour at Hobbiton like? Since I was curious myself before dropping a not-insubstantial amount of money on the experience, I decided I'd give you a little glimpse into what you can expect. Once our small group got off the bus, our guide, Mike, promptly led us through Gandalf's Cutting and into the heart of Hobbiton. The sun was low in the sky and behind some clouds, casting Hobbiton in a soft pre-twilight light. The light at this time of day was beautiful! I once again marveled at all the details, from the laundry hanging on the line to the decorated mailboxes (each once gives a hint at what the hobbit living in a particular hole does for work). The grounds were lush and filled with flowers and vegetables; there's even a flourishing herb garden that the chefs at the Green Dragon Inn actually use. Those veggies are fake, but they don't look it! Our tour took us from the entrance of the set all the way up to Bag End (Bilbo and Frodo's house) and down to the Party Tree and Samwise Gamgee's home. We stopped for photos inside a hobbit door, and to hear several stories about filming from our guide. I think we'd be quite happy here. This is bliss for a Lord of the Rings fan like me, but even non-fans can appreciate just how gosh darn ADORABLE this place is. 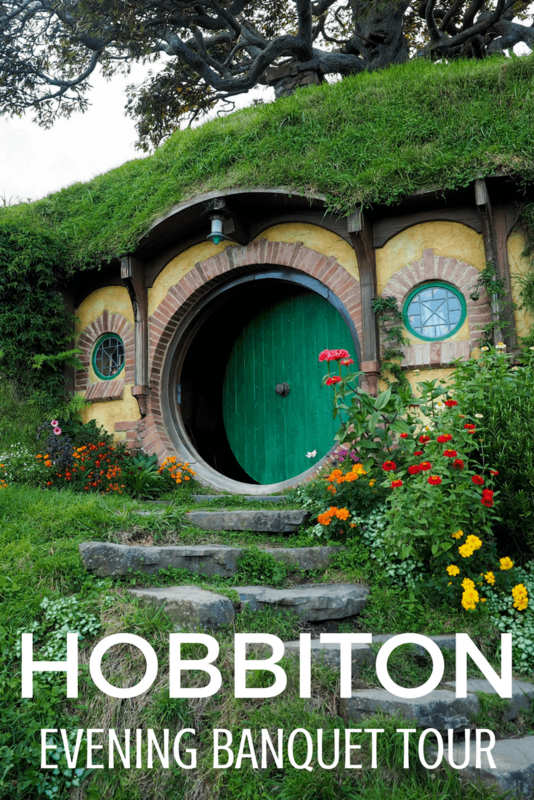 To read more about visiting Hobbiton, check out this post. After our tour of Hobbiton (which lasted about an hour), we made our way over a bridge to the Green Dragon, where everyone enjoyed a complimentary (and Shire-inspired) drink before dinner. They offer two ales, a cider, and a ginger beer for those of us who don't really do alcohol. What really sets this tour apart from the regular daytime tour of Hobbiton is of course the actual banquet dinner. Our guides revealed the dining room in a bit of fanfare, and then we piled around tables laden with food. And I do mean laden! There was beef stew, sausages, salmon, chicken (multiple full chickens, in fact), roasted squash, mashed kumara, and lots of other veggies. And after we stuffed ourselves with multiple helpings, they brought out a dessert board piled high with pies and tarts and pavlova. Any hobbit would have been thoroughly satisfied, I think. After we rolled ourselves out of the dining room, we picked up some electric lanterns and began making our way back through the Hobbiton movie set after dark. Little paper lanterns were lit in the trees, and many of the hobbit holes were illuminated outside, making for a rather twinkly scene. We stopped at the Party Field for a quick lamplit frolic, and had time for photos in front of one of the prettiest illuminated hobbit holes. All told, our experience at the Hobbiton Evening Banquet Tour lasted just over 4 hours, and included everything you could possibly want from a visit to The Shire. Even though this wasn't my first trip to Hobbiton, it was no less magical this time around. I 100% think it was worth it and would do it all over again! When: Wednesday and Sunday evenings year-round; times vary depending on season. In summer, they sometimes add additional evenings. How much: The Evening Banquet Tour runs $190 NZD per adult (roughly $137 USD). It's not a cheap night out, but considering you get a good dinner and a tour of the set, I think it's pretty good value – especially if you're a fan! Do I need to book ahead? YES. These tours/dinners are limited to less than 50 people, and they do sell out – sometimes well in advance. Is this something you'd like to do in New Zealand? Wow! I just did the daytime experience, with a much-less-interesting meal (though it was decent) and no nighttime walk. But it was living a dream, for sure! Do you plan to visit Weta Workshop while you’re there in NZ? The daytime experience is still awesome, but this nighttime tour really was pretty special. I was ready to stow away in a hobbit hole for the night! And yes, we’re planning to do the tour at Weta next week! What is the difference between The Evening Banquet Tour and Hobbiton Movie Set Tour in the morning. If i do only the Evening Banquet and not the morning one would i miss out on anything? Do i have to do both the Tour? The movie set tour is a full two-hour tour of the Hobbiton set, and includes a drink at the Green Dragon. The Evening Banquet tour includes a shorter tour of the set, and then a feast in the Green Dragon at night. You miss out on a little bit of the overall Hobbiton tour by doing the banquet, but you still see all the highlights – and the meal is great! Ahhh, so awesome! Definitely on our bucket list! It looks like the banquet dinner was well worthwhile and something we would do without question when we visit. Hoping to get there next year! It was really fun (and quite delicious!). It’s pricier than the normal day time tour (which is already not cheap), but if you’re a fan I don’t think it really matters! I visited Hobbiton on the regular day time tour last year, but this looks like a whole new level that I must experience. On the normal tour I was disappointed in the 15 minutes we were allowed to wander the pub & have a drink. This sounds like you had ample time to spend at the pub! Thanks for the suggestion. I’ve gone on a tour that you’ve recommended before—because you recommended it—and absolutely loved it! It definitely is on another level! And yes, we had some time to enjoy the pub, and there was time for more wandering around during dinner, too, which was fun. It’s a different experience than the daytime tour (the tour of the Hobbiton set is shorter, for example), but it’s a must for any LOTR fan! We didn’t feel bad about spending that much for the experience, either – we had fun! My husband and I are huge LOTR fans and would LOVE to do this tour! Food plays such a big part in the Hobbit especially, you HAVE to go dining there. Definitely on our wish list!! Yes exactly!! I felt very hobbit-y after that feast! Ahhhh I love your video of this!! It looks like such a great tour! I’ve done the day time one which is still incredible, but this one is an amazing honeymoon activity! I want to go back to New Zealand soooo badly, and it seems like I just keep adding things to the list for when I do lol. Girrrrl, this is my fifth trip to New Zealand and I’ve STILL got a “next time” list for this country! Omg this looks like so much fun! I was supposed to go to New Zealand last month but my flight got cancelled 🙁 Will have to make it there one day and definitely check out Hobbiton! Oh no! Well hopefully you make it there soon! I like that you still get excited visiting a place for the third time. I would be excited too to be honest! The banquet seems like a great thing to do when you’re there. I would definitely take it into consideration when I visit NZ! You have me DYING to go here now!!! It’s so cute and pretty and quaint! I didn’t want to leave. It’s seriously SO cute. This is great! Visiting Hobbiton has been on my to-do-someday list since the first time I saw the first LOTR movie. Not sure if I’ll get there (I’m more of a local traveler) but your post and video made me feel like I was right there! Happy to be able to transport you there at least for a few minutes, Maureen! Hi Akatuki.I have shared your work with face book and Instagram mates.I hope that a few of them will pay attention!! Haha.Kiaora. OMG Akatuki, Hobbit house ?! I really want to start saving some money and try to visit that awesome place next year.. Thank you so much for sharing to us, appreciate it ! Oh my god this looks amazing! When I visited NZ they were filming the Hobbit so it wasn’t open to visitors, I was gutted! The banquet sounds soooo amazing! Thanks Akatuki for the very interesting post. New Zealand is a very beautiful country. There are so many interesting and unusual places in New Zealand. Thank you for the wonderful photos. New Zealand pretty much has it all! Alright this is absolutely on my must-do list for NZ now! I knew I wanted to visit Hobbiton but this seems like the ultimate experience for this hobbit at heart. It’s really fun (and tasty! ), and certainly is perfect if you’re a fan! I can totally relate! Haha. You definitely need to go back! Hobbiton is a proper tourist attraction now, but I still love it. This is awesome! If I ever find myself in New Zealand, I’m signing up. It was so fun! I (obviously) highly recommend it! We were on the tour with you, and I thought I’d check out your blog. Quite fun to see ourselves in your pictures and video. It is totally worth the money if you’re thinking about it! Thanks for stopping by! It really was a great tour!